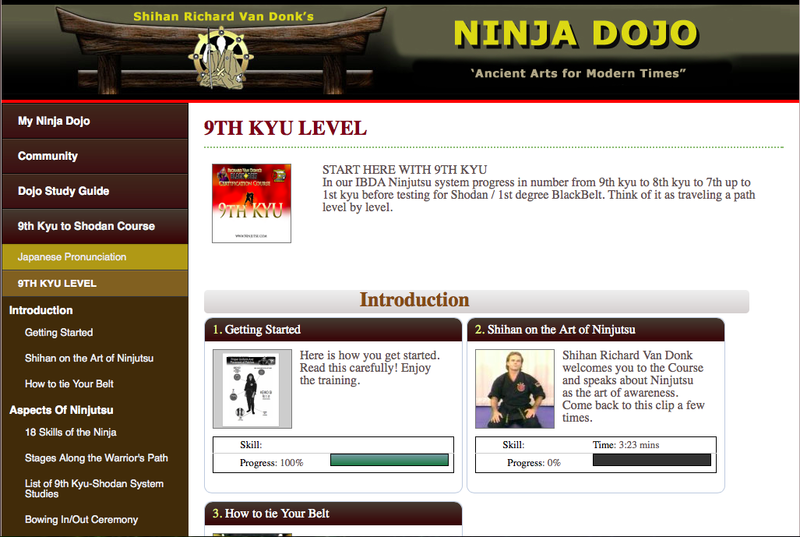 Study at your home or dojo with this very comprehensive one of a kind MARTIAL ARTS TEACHER TRAINING COURSE. Master Richard Van Donk has trained hundreds of students all over the world that are now running their own dojos or training groups. Let his 40+ years of expereince of being a martial arts teacher, public speaker and trainer make you a great Martial Arts teacher – No matter what art that you teach. 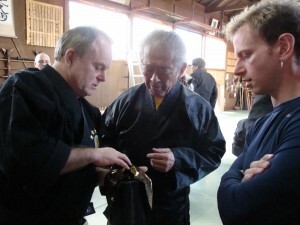 Bujinkan Senior Master Teacher Richard Van Donk (15th Dan), over 50 trips to train in Japan carefully and strategically crafted for you and easy to learn step by step system your learning Ninjutsu, the art of the Ninja. Studied worldwide in 100+ countries. REAL training. This is not a rank mill. Your 1st Degree BlackBelt will take you about 2.5 to 3 years then usually another 2 years to get your Nidan with much hard work and perseverance. 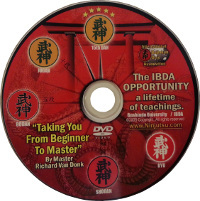 IBDA’s additional courses will take you from Beginner to Master. Why not you? Certified Bujinkan Ninjutsu Teacher (Shidoshi) Training TODAY! Shidoshi Teachers Training Only Available At IBDA! 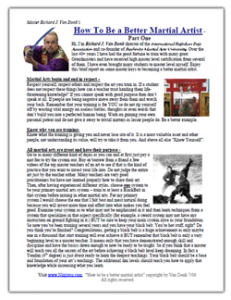 Learn the true meaning of the Do/Dao/Way in the Bujinkan Teachings. You can be a Black Belt in techniques and a White belt at sharing it. There seems to be nothing worse than standing in front of a group of people who are waiting for you to start speaking and you do not know where to begin or are afraid to speak to them. It can happen to anyone but it usually happens to people that are unprepared or un-skilled. Teaching is rarely an inate gift. Teaching effectively is skill set that must be learned. Teaching can be challenging on many levels until, over time,you learn how to teach by trial and error OR you get trained in a proven step-by-step method, possibly avoiding years of painful stress on yourself or just getting too frustrated with it and quitting as so many often do. Or worse yet the fear of it stops a person from trying at all. Everyone has something great in them that others can benefit from. Don;t let any of those things get in your way of sharing what you love. Becoming a teacher is a natural progression for most all students who reach their BlackBelt level, sometimes even sooner, as friends and family become curious about what you are learning. Sharing what you love is magical and gives you a great feeling inside. But it is one thing to be able to do techniques and a whole other thing to be able to share the teachings in a way that others can under­stand and duplicate what you are sharing. When the size of your group increases to 10, 20, 50 or even 100 students on any consistent basis it can be very overwhelming if you are not trained in how to handle this. And who wants to be bad at sharing something that they love? Or who wants to be teaching it wrong and scaring people away? Not me! The IBDA Shidoshi Teacher Training Course is designed to teach you how to set up your dojo trainings, create schedules and themes, and how to select material for your classes. It will also teach you how to instruct a class and how to handle challenging dojo situations. It will teach you how to interact with your students in a way that keeps them coming back for more. Shihan Richard Van Donk will teach you how to teach by breaking down how he teaches, how he trains his instructors and the secrets to keeping your students active in the dojo while helping them to have better lives and getting paid to do this. Just keeping one student longer because of what you learn in this course will pay for your entire course! Keeping two students will double your investment return! We have asked this question to many people over the years who have achieved Blackbelt level from us:“Would you sell your Blackbelt knowledge, the changes it has made in your life, the impact it has made on others and the friends you have made for $50,000?” Their answer? NO WAY! In one class of 20 Blackbelts they all said NO even to $1,000,000 – They actually said that they would turn down one million dollars! Now that really says something! We are accepting new IBDA Shidoshi Instructors at this time. The Shidoshi Teacher Training Course is a required prerequisite to becoming an IBDA Shidoshi-ho(Junior Liscensed) Bujinkan instructor. You do not have to be an IBDA member to get this course -- at this time. This has been a big debate with my staff and current Shidoshis. This course is so loaded with unknown secrets of the art that they wanted me to keep this knowledge only for the people directly training with us. But I want everyone to benefit and have an opportunity to learn this knowledge so I told them that I would test offering it to everyone. I want you to know that at anytime I may stop offering this course to the general public and make it only available to IBDA enrolled students. That's why if you think this course is for you then I suggest you get it now while you still can. I know that this is an excellent course as it reveals 40+ years of my own teaching knowledge and took me over 2 years to write it for you. I really put a lot into it so that you could become the best teacher you can be. Take advantage of this opportunity now while it's available. 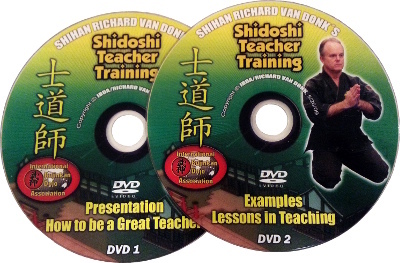 Shidoshi Richard Van Donk recorded the entire Instruction Manual PLUS more on audio! Become an instructor of Ninjutsu registered in Japan. 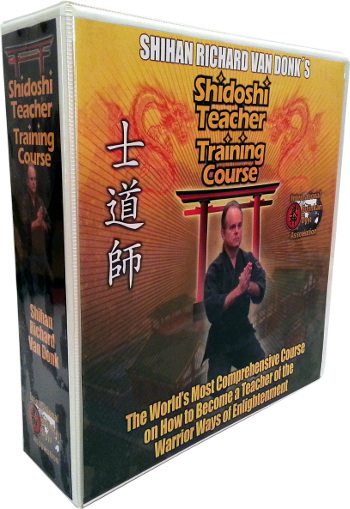 IN THIS COMPREHENSIVE SHIDOSHI TEACHERS TRAINING COURSE ARE ALL THE LESSONS YOU NEED TO BE YOUR BEST! Easy to Learn Step-by-Step Instruction! P.S. It is one thing to be able to do techniques and another to be able to share the teachings in a way that others can understand them and be able to do it well. This course will train you how to set up your dojo trainings, create schedules and themes, and select material for your classes. It will also teach you how to instruct a class and how to handle dojo situations. Most importantly it will teach you how to interact with your students. Let’s face it – you would not be reading this far unless you were really interested in being a Shidoshi or in learning more about how to teach. Or perhaps you really need help with how do lesson plans for your students -or maybe you just want to be a part of this ancient lineage and be able to accurately pass it on down to your children. Whatever your reasons we urge you to get started today, if you haven’t already started on the Shidoshi – Ninjutsu Path. Like everyone else, you begin your training at 10th kyu (no rank white belt). At IBDA we all start the journey at the same place:with the first level of learning the 9th kyu material. Our desire is that when you get your Shodan (or Nidan) you will already have been trained to open up your own Ninjutsu dojo because of studying this course, and those that complete this course certification (test required) will be granted a Shidoshi-ho (becoming a direct student under Shihan Richard Van Donk) issued by GrandMaster Soke Masaaki Hatsumi at the Bujinkan headquarters in Japan. All our IBDA ranks come from Soke Masaaki Hatsumi in Japan. 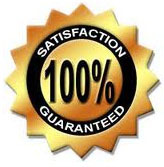 We consider getting your Shodan a major level of achievement. The next achievement, Level 2, would be earning your Shidoshi-ho. Achievement Level 3 is to advance through the 2nd dan – 5th dan educational materials which we have carefully established in order to prepare you for the 5th dan (Shidoshi) test. However, the greatest achievement level of all is what you will feel inside, the changes you have made in your life and how these changes have affected others in your life because of your dedication and hard earned efforts. It is a fact that these studies have been proven to change lives. Yours could be the next one changed. Start your journey of being a great Shidoshi today. I look forward to helping you realize your dreams, Richard Van Donk, Shidoshi IBDA Director – 15th dan under Soke Masaaki Hatsumi. I cannot promise that if you check back later that this offer will still be available at that time. Which one of the above qualities could change your life?